The hognose snake is pretty nice! I'd crop it a little tighter though. That picture is all about the snake's defensive display, the colors you can see when it spreads its neck, etc. I'm afraid the landscape takes away from, rather than adds to this picture. My general advice to you would be to think about what you want to communicate in each of your pictures. Once you have determined that, then you can decide what elements need to be included in the composition and what elements need to be left out. Another example, with the frog shot I assume you wanted to show a bit of the animals habitat along with it and to that end the out of focus portion in the upper left is not adding anything to the composition. Again a closer crop, emphasizing just the grass and the frog would be stronger. Again with the first red-eared slider, those stripes on the neck are pretty interesting visually, so crop to emphasize those. The green grass just looks like someone's lawn. The racer also needs cropping. All the empty space on the right side is adding nothing. Try that one as a square aspect ratio. Finally, the second red-eared slider is a nice close-up, but the most important diagnostic feature of the turtle, (and one which would be visually interesting), the red ear stripe is hidden. That picture would be better if you had waited out the turtle until it extended its neck. (And yes, I know how long that can take)! I hope my suggestions don't come across as negative. I'm always a little leery of responding when people ask for critiques. On the plus side you seem to have the technical stuff, exposure, focus, etc. down, so that will allow you to concentrate on the artistic end of things. Keep shooting and have fun! Thank you very much! I dont find your advice to be negative at all, we all need to hear others' advice to get better so it's great when people can point out the possible negatives so that they can be changed in the future. Personaly, i like a less tight crop on a photo, but then again my taste is a little different than most people. I will definitely try cropping them more though to see how they look! Do you think it would be easier to get away with a looser crop if the DOF wasnt as shallow and the landscape was interesting? I like the idea whole herp-in-habitat style, but at 90mm it's a challenge to get enough of the landscape in the shot to be beneficial to the picture. Thanks again for your critique and advice, much appreciated! NewYorkHerper16 wrote: Thank you very much! I dont find your advice to be negative at all, we all need to hear others' advice to get better so it's great when people can point out the possible negatives so that they can be changed in the future. Personaly, i like a less tight crop on a photo, but then again my taste is a little different than most people. I will definitely try cropping them more though to see how they look! I think that the point I was trying to get across may have been muddied by my making suggestions on all of the pictures you posted. Perhaps its best to only deal with one picture at a time. We photographers have a large arsenal of techniques and artistry that we can use to get our message across when we take a picture. 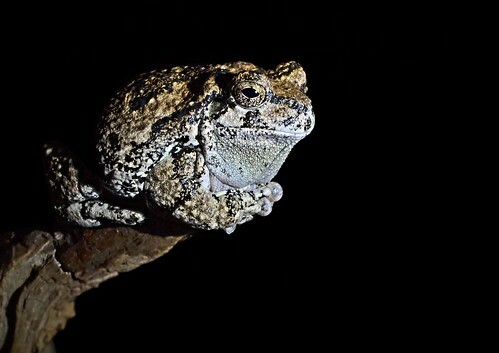 The point is not to always crop tighter or looser, use shallow or deep depth of field, or always shoot herp in habitat or field guide type shots. The situation we are faced with and the story we want the photo to tell will dictate the techniques we use and the way we compose the shot. 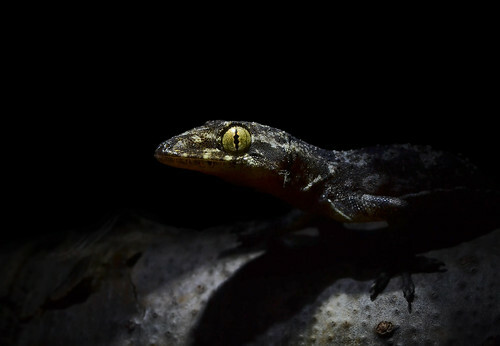 If you prefer to show herps in habitat, then that's great! A lot of my own photographs do just that. Of the pictures you posted I think 3 could be classified as herp in habitat shots- the hognose snake, the frog, and the first red-eared slider. Of those three I think the hognose snake is the most successful, so lets deal with your questions concerning only that picture for now. You do have an issue with depth of field in that shot, not so much because the habitat is out of focus, but more because the back end of the snake's body is out of focus. NewYorkHerper16 wrote: .... and the landscape was interesting? The landscape is interesting enough. I can see that it is sandy and open. It gives me a good sense of the kind of places this species might inhabit. Personally, I much prefer the kind of landscape you have here to the grand landscapes behind obviously posed herps that we often see in "Grismeresque" style photos. NewYorkHerper16 wrote: I like the idea whole herp-in-habitat style, but at 90mm it's a challenge to get enough of the landscape in the shot to be beneficial to the picture. Again, I think sometimes having a little slice of the landscape is often more effective than having the whole forest/plains/desert/whatever in the background. In fact I would again argue that this picture would be more effective if you cropped even tighter. Specifically I would suggest cropping out most of the blank sky and a lot of the right side of the photo. This would have the added benefit of placing the snake's head close to one of the rule of thirds intersections, (a good compositional device to keep in mind, just don't become a slave to it). I think if you did that you would have the same sense of the animal's habitat you have here, but you would also really emphasize all that beautiful coloration on the spread hood. Of course you will likely buy a wide-angle lens at some point, which will allow you to include more of the habitat and which will come with its own set of problems to deal with. That's what keeps photography interesting and fun! Thank you very much for taking the time to explain more, i agree with all you said! The DOF issue has been something i have had very conflicted opinions on. On one hand, in the hognose photo i like the shallow DOF because it draws the eye to the important part of the snake, the spread hood. On the other hand, with your advice of cropping it, i would not need such a shallow DOF and could have more of the snake in focus while still drawing the eye toward the hood. Next time i'm out herping i will take shots on a variety of different settings and see what i like the best. Most of my previous photography has simply been field guide type shots (tight crop, very little DOF, posed herps), and i want to break away from that as much as possible, as said in the original post. I can't wait to eventually get a wide-angle lens! I've seen some extremely talented herpers produce incredible in-habitat shots with those, so that's high on my list of new equipment to get! I definitely need to spend a few years practicing with the my current lens first before i get myself into that though. I've been passionate about herping my whole life, but photography has recently added a completely new and interesting dimension to it! I cant wait to learn new tricks and improve the quality of my shots! I know i keep saying it, but thank you so much for helping me out and giving me knew food for thought! They all look great, take the pics that "you" like, I really like all of them. First of all, let me say that I've really been enjoying your photos. 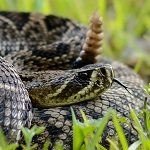 I'm especially fond of your recent hognose photo, it's always great to get a photo like that of a lifer! In terms of composition, it's been said already, but you should focus on what looks good to you. As for me, I try to shoot all different types of shots to keep things interesting. Both "in situ" and posed "field guide" type shots. Both in habitat and close ups. Head shots and scale detail shots. Narrow depth of field and broad depth of field. I also love it if I can capture the snake "doing" something, such as exhibiting defensive behaviour, etc. I always try to go into the field with an idea of what kinds of shots I want to capture and then see how many different kinds I can get. I've also started experimenting with snakes I find while cruising for them after dark. I'll pose them on the yellow road stripe and use a flash in such a way that there is just pitch black in the background. I'm trying to simulate the excitement of seeing a snake pop up in your headlights when you are cruising. Anyways, those are just some things that I try to switch it up and keep things interesting. I'm not sure if any of that is helpful, but there it is! I should also say that, like you, I try to just use natural light for shooting whenever I can. I really prefer the way it looks. However, that becomes an issue when shooting at night! I've gotten myself an external flash and softbox for nighttime shooting and I'm really liking that too. Thank you both! I like the idea of that too, taking a variety of different types of photographs. Night photography is a fun challenge too! Of couse, as you said, natural light can be a bit of an issue for that lol, it is fun to experiment with different techniques. This year I have been experimenting with using a flashlight as the sole light source in an image, and although it doesn't produce a "traditional" type of shot, I actually think it looks pretty cool! There are a couple people I have seen on Facebook and Flickr that have really mastered this technique! Perhaps that might be a decent way to show the excitement of seeing the snake pop up in the headlights? You might need to use the aid of an LED flashlight to give enough light for the picture (since headlights by themselves might not be bright enough), but I think that would be pretty awesome! Here's a couple I've shot with a flashlight. None of them are very good, but I still do them because it's a lot of fun! I'm hoping to learn more about this technique so I can get better as time goes on! I use a Maglite 168 lumens. 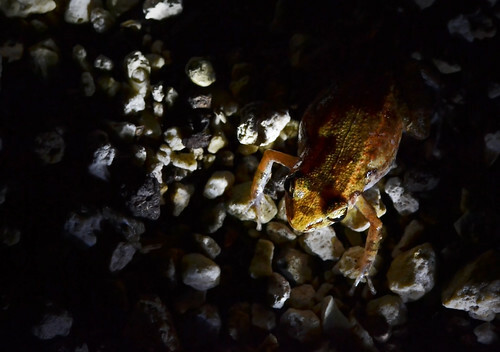 I didnt buy it specifically for photography, but for general night time herping instead. It works really well for finding frogs and other herps at night and so far has been really sturdy! The best results i've had so far, as far as settings go, is with ISO 800, 1/500 shutter speed, f/13. Keep in mind that you will need to do some editing to get the picture looking its best. I reduce noise in the background, sharpen the subject, and add a touch of vignetting to enhance the "night" effect. I'm sure there are other things that people do to make them even better, but this is just what i have experimented with and liked the results. Oh, forgot to mention that manual focus seems to be the way to go for this technique. Autofocus (at least in my setup) seems to have a tough time in low light conditions. You should post larger images here. I get a much different feel from the photos when viewed large on your flickr than when looking at the small images in your post. As Bill said, your exposure and focus are spot on, so no need to worry about that. It all comes down to composition and depth of field. I actually disagree with him somewhat on the amount of out of focus area in the images, which goes to show you a lot of what makes a "good" image is in the eye of the beholder. I really like the first three images, overall, and wouldn't change them much. On the pickerel frog, I think you could crop more. I still wouldn't go really tight, though. 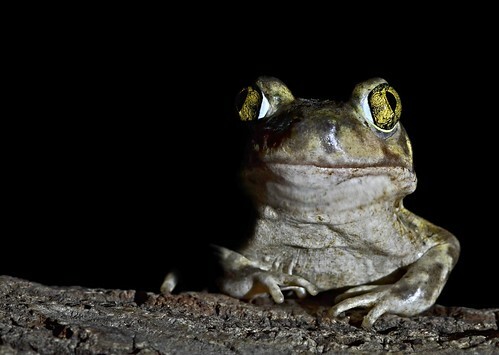 Again, the narrow DOF works here to make the frog stand out. You would never want to use this narrow of a DOF on a field guide style shot, and likewise, I don't think you would want to use a wide DOF on a shot like this that shows more of the habitat, because the animal would quickly get lost. The first slider photo has some really nice lighting and I like the pose, angle, and crop. But as Bill mentioned, I wish it were on something other than grass. Thank you very much! I do still have some trouble with composition and depth of field. This summer i am planning on really learning more about both of those factors so i can improve my photos. And yes, the grass definitely was not an ideal substrate for the slider picture. Although i do feel it "fits" in a certain way for Long Island, where many of the areas sliders are common in happen to be suburban with lawns like this. When viewed from a different standpoint, however, it doesnt make as much sense. Next time, i'll aim for a more natural setting! Thanks again, everyone who commented! It's all extremely appreciated!